First pressing is this issue (MCA logo on rear, "anti-parent" sticker on some, "UNI/4" matrices). First version recut/reissue is here: Damaged (No MCA logo, "Kendun" matrices). Second version recut/reissue is here: Damaged (no MCA logo, "Neo-Gelatinous" and S-9375/6 matrices). MCA Records (with which Unicorn Records had a distribution deal) distribution chief Al Bergamo announced that the company would not distribute this record, deeming that "It just didn't seem to have any redeeming social value" and because, as a parent with two children, he found it an anti-parent record. "Damaged" was eventually released by Unicorn through an independent distributor. Later, after Unicorn's bankruptcy and almost years of litigation during which Black Flag was forbidden to release any record, they re-released and distributed it through Greg Ginn's own SST Records. 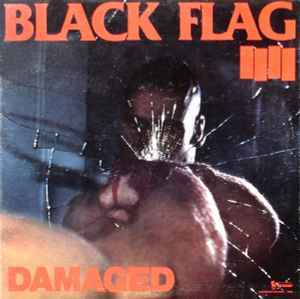 This record cost Black Flag $8,000 (USD) to produce. 25,000 pressed. Lyric sheet was available by mail. Some early copies released with a sticker stating "As A Parent..., I Found It An Anti-Parent Record..." on the back of the jacket, covering up the MCA distribution logo. I just saw a version with a printed "sticker" on back side. Does anyone knows what version or whatever this is? Maybe unofficial. Does anyone know why all the represses after 82 stopped using a full color cover? I can provide scans of the lyric sheet (available only via mail order back then) so if interested just pm me. I love that Prince "purple rain" and Springsteen "born in the U$A" are in the recommendations for this. Hahaha.. ummmmm? My copy has, like, a 12x12 poster reproduction of the album cover, blank on the other side. Unicorn logo and all. Was pinned to someone’s wall at some point. Anyone else have anything like this? I have a copy that has a blank all white back cover....What is this? A good album but I prefer the earlier singers by far. At this stage of his career Rollins sang like Froggy from Our Gang, or like he had some hard morsel of food stuck in his throat.